A Message from Campus Safety Director, Jeffrey Hertel – Alumni & Family Engagement | Hope College on Need a Ride? It Takes an Entire Campus to Raise a Safe College – Campus Safety | Hope College on Need a Ride? One of the most familiar faces around campus is Campus Safety Officer Henry Chen. Chen was born in Taiwan, moved to New York City as a small boy, and then made his way to Holland as a student at Hope College where he majored in religion and graduated in 1999. 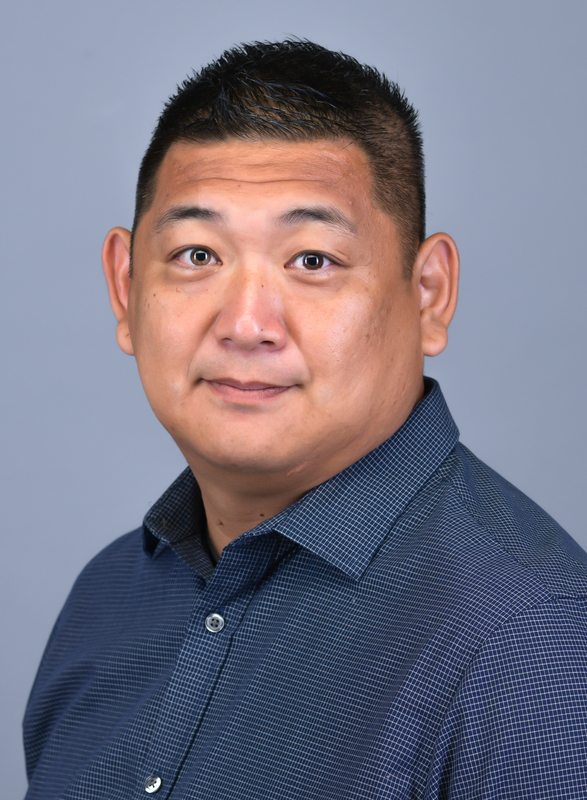 After briefly attending medical school at Brown University, Chen missed the community and atmosphere he had left behind and made his way back to the college to begin his career first as a dispatcher and then as a campus safety officer, a position he has held for 15 years. He brings a vibrant commitment to the Hope community and its students, faculty and staff. I consider myself ‘Made in Taiwan’ but I grew up in New York City. I only lived in Taiwan when I was very young, but I remember the environment to be quite different and I was always a sick kid. While I was in elementary school, my family and I immigrated to the United States where we lived in Queens, and I would commute to Brooklyn every day to go to high school. My family owned convenience shops, a laundromat, and a small Taiwanese restaurant. I am grateful for the diverse childhood that I had in the city. I am married and have two kids. My wife Julie is a Hope graduate and works for our church at First Reformed Church in Zeeland as the coordinator and communications manager. Acacia is in 3rd grade; she is artistic, caring, and empathetic. My son, Micah, is in 1st grade and along with his sister, he loves music and plans on going to Hope. How did you first hear about Hope College? Growing up in New York, my family and I went to a Reformed Church and a pastor felt called to tell me about Hope College and why I should attend school there. He told me that along with the outstanding education I would receive at Hope, the people whom I’d meet there are the kind that make a difference and are going to change my life. Through my years as both a student and staff member, I have found that to be true. What were you involved in when you were a student at Hope? I majored in religion and I was a student-athlete. I was on the track team and the men’s (club) volleyball team. I was a moraler and eventually a morale coach for Nykerk. I worked as a student campus safety dispatcher and a student officer. Coming from the inner city to Holland, there was little diversity and Hope Asian Perspective Association was just getting started. I became a part of that organizations and found other friends of different Asian descent. However, along with that, I found friends from all backgrounds who made a point to engage with me and get to know me for who I am. What is the best part of being a Campus Safety Officer at Hope? The connections that we make with people at Hope College. I have been a part of this community for a very long time. Not only as a campus safety officer but many other positions at Hope as well. Through my assistant track coach position, a brief stint as the resident director in Wykoff, working for the Hope Summer Repertory Theatre, and my campus safety position. As a campus safety officer, we see all parts of student life from the best to the worst but through all circumstances, this job allows me to help people every day. Meeting people and investing in the lives of students. Getting to know people who I come across whether it is out in the volleyball world (see below) or around campus. I feel called to get to know people and tell them that they are important and to value whoever may come my way. When I am not working as a campus safety officer, I am a state volleyball referee and a national volleyball line judge. 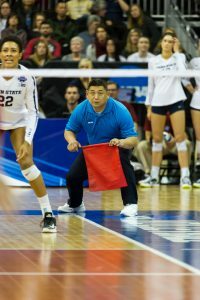 Recently, I was a part of the officiating crew for the NCAA Division I Women’s Volleyball Final Four. It all started when I came to Hope and my roommate and I were on the men’s club team and the athletic director asked us if we could do the lines for Hope matches. One of my favorite memories as a line judge is the first time that I line-judged at the brand-new DeVos Fieldhouse and Hope was playing Calvin. The game was very intense and towards the end, the anticipation was palpable. When Hope won, the whole arena roared and it was the loudest roar I had ever heard. It could only be described as a feeling of pure joy for the spectators and you could feel the weight of that in the [gymnasium]. What is one piece of advice you would give Hope students? Step into Hope’s mission in whatever way it speaks to you. Hope College provides so many opportunities and connections. Although you may fear that next step, listen to the multiple positives that this community can bring you. This is the second in a series of personal profiles about the officers who serve Hope College. Together with all members of the campus community, the Campus Safety Department strives to provide a safe and secure environment for all to learn, live and work.